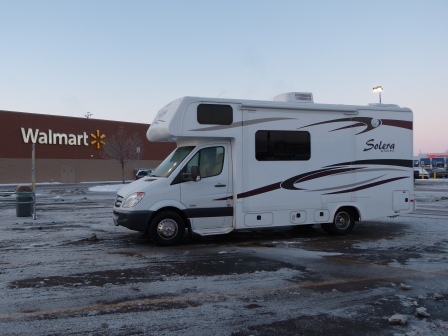 I picked up our motorhome from the dealer in Des Moines, Iowa on December 28th. I drove out into the night and a snow storm. 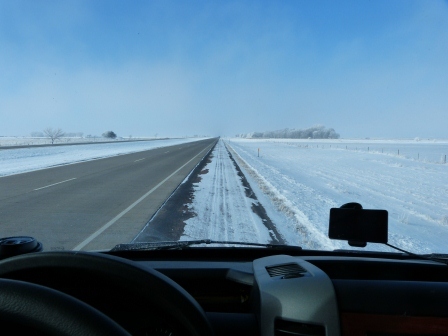 The roads were slick with uneven layers of ice still clinging to them from an earlier blizzard. I sat idling in the parking lot while I figured out the controls, including the in-dash GPS. I eased on to the freeway and headed west towards Omaha, Nebraska. 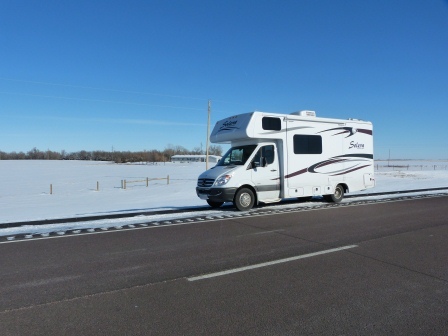 The steering was pulling to the left and I thought I might have a problem, but I kept going because the dealer was closed anyhow, and I later learned that it was just the wind steadily pushing on the broad side of the motorhome. I stopped for fast food, then drove for a few hours before pulling in to a Walmart just off the freeway after 10 PM. I headed in to the store to buy some road trip essentials – some jugs of drinking water, a tea kettle, a dozen diet coke, a variety pack of potato chips, chili chocolate, some $10 vinyl floor mats, and a plastic bin to hold my snowy boots. It was cold out, 10 or 20 degrees below freezing, but I stayed warm in the arctic sleeping bag that I’d borrowed from my friend Lee. The next morning I woke up early and the sun was shining. I purchased fuel, mistakenly buying more expensive biodiesel which should be OK for our new engine (I hope?). Although it was cold, the weather and the roads were clear, so I prepared to ‘make time while the sun shines’. 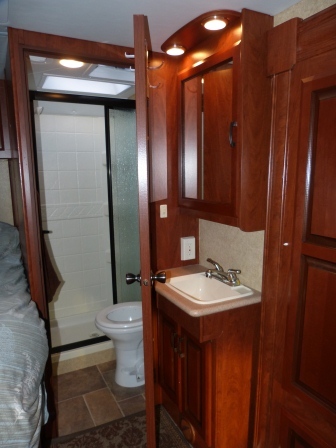 I drove 15 hours the first day, stopping only for fast food, fuel, and toilet breaks. I drove west through America’s heartland on Interstate 90 through Iowa, South Dakota, Wyoming, Montana, Idaho, and Washington. I passed a lot of famous attractions – The Black Hills, Mount Rushmore, Sturgis (home of the massive annual Harley Davidson gathering), The National Museum of Wood Carving, The South Dakota Hall of Fame (OK, perhaps some of them aren’t so famous). I went right by The Bridges of Madison County (made famous by the Clint Eastwood film of the same name), The ‘World’s Only’ Corn Palace (do we really need more than one? ), 1880 Town, Wall Drug, and the Ranch Store (‘where you can feed the prairie dogs for free!’). I also skipped the Car Museum (which has one of probably many General Lee’s from the Dukes of Hazard), Wonderful Cave (‘the largest in the mid-west’), and The Prairie Homestead (that can’t be very exciting, can it?) I also missed the Badlands, Devil’s Tower (from Close Encounters of the 3rd Kind), Grand Teton, Yellowstone National Park, and the Rocky Mountains. I’ll have to slow down next time. What I found interesting was that many of these attractions are advertised on billboards for 100 or more miles in advance. I couldn’t believe that I was still seeing more signs for something hours after they began. By the time I got there, I’m thinking, ‘maybe I should check this out? I can’t believe that someone went to so much effort. Perhaps it’s good?’ But I suppose that’s the intention. The engine light came on at sunset of the first full day of driving, which had me worried. It turns out that the engine light comes on when the fuel level drops to the point that one begins using the reserve tank. Soon afterwards, the fuel warning light comes on. Why wouldn’t it be the other way around? I passed many helpful signs like, “Help manage our wildlife, wear fur”. Also, ‘God Loves You’, followed soon afterwards by, ‘The Wages of Sin is Death’. I guess that’s the carrot and stick approach. I saw one that said, ‘Jesus is Lord in this Valley’, and I thought, ‘why limit yourself geographically?’ Did the probably well-intentioned author mean to limit God’s jurisdiction? I drove another 15 hours the second day and came over Snowqualmie Pass late in the evening to arrive at Seattle. I drove a little farther to get to the north of the city which would allow me to avoid most of the morning traffic. 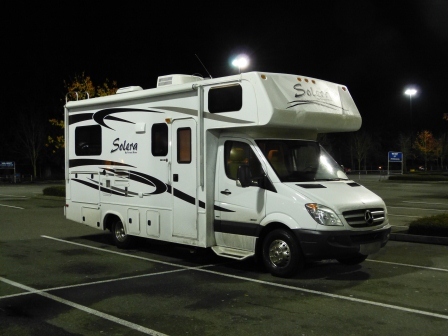 I spent my 3rd night on the road in a Walmart parking lot in Lynnwood. The weather was finally warming up, but still just above freezing. On the morning of Day 3, I discovered that the kettle I had purchased at Walmart and had been using for the last 2 days still had what appeared to be the instructions inside, but it was hard to know for sure because it was just a soupy mess. Surprisingly, it didn’t affect the taste of my tea. I drove north to the Pacific Highway Truck Crossing at the Canadian border between Blaine, WA and Surrey, BC where the US Customs and Border Protection Office that handles vehicle exports is located. I had submitted the required export paperwork to US Customs more than the 3 business days in advance that they require. 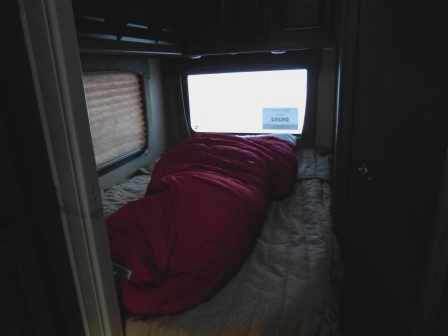 I waited while dogs searched the lobby and me until the agent returned to confirm that my motorhome hadn’t been stolen, stamped my paperwork, and sent me on my way. One hundred meters later at the Canadian border crossing, I was instructed to park and take my paperwork inside. They calculate and collect the Goods and Services Tax (5%), but they also wanted to charge me 6.1% duty, which came as a surprise. I was under the impression that the Mercedes=Benz Sprinter chassis was manufactured in Germany but assembled in Charleston, South Carolina making it duty-free under the North American Free Trade Agreement (NAFTA). However, the Vehicle Identification Number (VIN) on our chassis starts with the letters ‘WD’ which means that it was made outside of North America (the ‘W’) in Germany (‘D’ is for Deutschland), and that is all the Canadian Customs and Border Protection agents consider. I spent 3 hours at the border researching and calling people to try and prove otherwise, but I was mistaken. 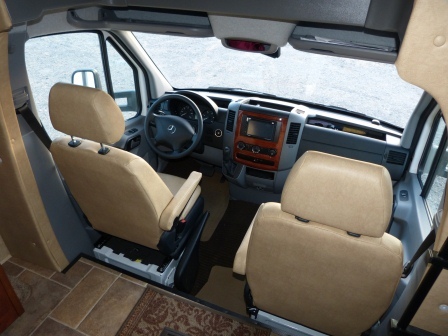 It turns out that Sprinter cargo and passenger vans are assembled in the U.S., but Sprinter cab chassis, upon which our and all other Sprinter-based motorhomes are built, are shipped fully assembled from Germany. So I paid the additional duty, watching some of my anticipated savings from buying in the U.S. disappear. On the positive side, I did make it home in time to enjoy New Year’s Eve with Diane. 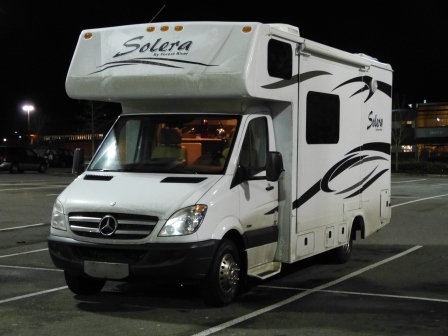 The other challenge with buying a motorhome based on the Mercedes-Benz Sprinter chassis in the U.S. is the warranty. 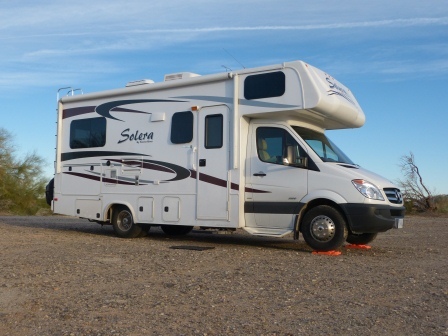 Although a motorhome built on a Sprinter cab chassis has a full warranty if purchased and registered in the U.S., this warranty becomes invalid when the vehicle is exported and registered in Canada. 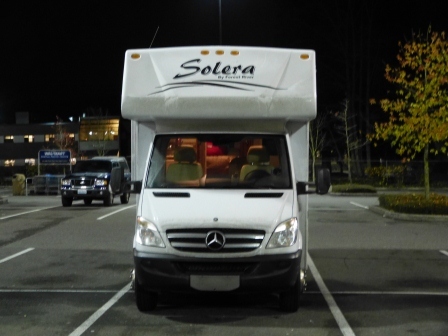 On most Mercedes vehicles Mercedes-Benz Canada would then honour the remainder of the warranty, but only after charging thousands of dollars to convert the vehicle to their, not Transport Canada’s, standards. This surtax allows them to maintain a significant price differential, charging thousands of dollars more for the same new vehicles in Canada. 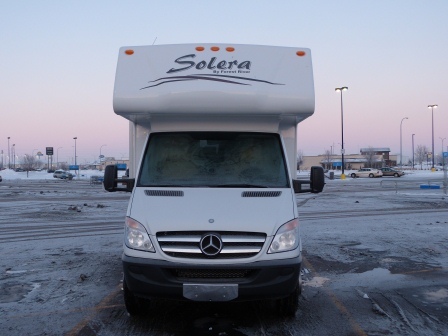 Unfortunately, Mercedes-Benz Canada will not honour the warranty for the Sprinter cab chassis, supposedly due to the modifications made to convert it to a motorhome. However, Mercedes-Benz U.S. does provide a warranty for the same converted vehicles, so this seems to be a convenient excuse to discourage Canadians from buying in the U.S.
Back in Canada, I took our Solera for the required federal inspection at a Canadian Tire store, and then got it registered and insured at an Insurance Corporation of BC (ICBC) agent. Upon registering it in Canada, my Mercedes-Benz warranty disappeared. Do I sound bitter about this? I shouldn’t, because I knew about it in advance and chose to import a Sprinter-based motorhome anyhow, but apparently I still have some energy about it. 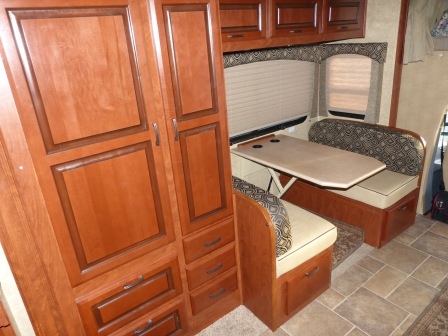 If we had purchased a Ford, the other manufacturer of motorhome chassis in North America, I would still have a warranty and I would not have paid duty. But I would also own a Ford. It took me longer to drive home than the estimates provided by our GPS and Google Maps because the speed limit most of the way was 75 miles per hour (121 kph). 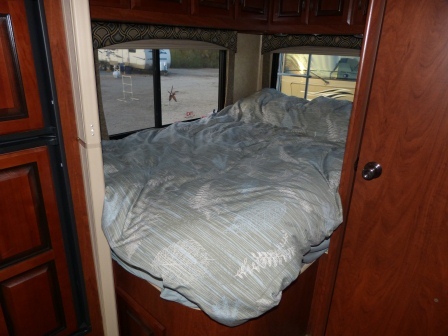 In the motorhome I drove 65 mph (105 kph) on the highway during daylight hours and 60 mph (96 kph) in the dark. I averaged 12.8 miles per gallon (18.4 Litres per 100 km), but this will improve as the diesel engine breaks in and I slow down a bit. Diesel fuel averaged $3.70 US per gallon, and an almost-empty tank cost about $75 to fill. 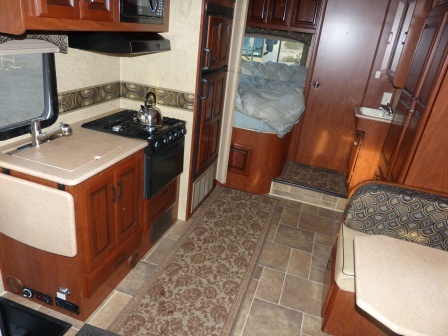 When I picked up our motorhome it already had 800 kilometers (500 miles) on it. My trip was 3220 kilometers (2000 miles), bringing our total mileage to about 4000 kilometers (2500 miles). 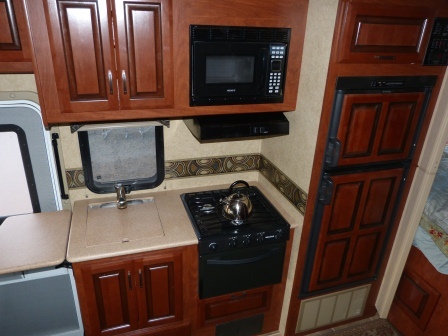 In hindsight, I still think that we made the right decision to purchase our motorhome in the U.S. and import it ourselves. Even with the unexpected costs, we still saved significantly. However, we are now relying on the famous German engineering and quality, as these savings could disappear if we have any major problems with our Mercedes chassis. We are placing our bet on the Germans, Would you? This entry was posted in General, North America, Travel and tagged Canada, customs, Des Moines, drive, export, import, Iowa, Mercedes-Benz, motorhome, return, RV, Solera, Sprinter, travel, trip, United States, US, warranty on February 12, 2013 by dreambigliveboldly.